Glen Trothy is set in tranquil secluded countryside in the quiet village of Mitchel Troy , 1� miles from Monmouth, lying at the portals of two of the most bewitching areas imaginable; the spiralling Wye Valley and the lush Royal Forest of Dean. The countryside is both picturesque and remarkably varied; the whole area steeping in history, castles and abbeys, not forgetting the many varied local attractions. The park it self is peaceful and secluded but easily accessible. Glen Trothy Caravan Park offers the following facilities. 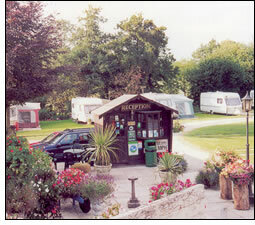 Have you been to Glen Trothy Caravan Park? Please submit your review so that others can benefit from your experience. Important note: Information provided here about Glen Trothy Caravan Park is based on our best knowledge. However, please check with Glen Trothy Caravan Park before booking to ensure that you have the information required. Reviews are the sole views of the contributor and do not necessarily represent the views of CampsitesandCaravanParks.com or Glen Trothy Caravan Park.